Road rage is a serious problem. How much of a problem? According to AAA, some form of aggressive driving action (tailgating, erratic lane changing, illegal passing, etc.) is a factor in up to 56% of fatal crashes. In this issue, we’ll talk about how you can avoid being victimized by an aggressive driver. 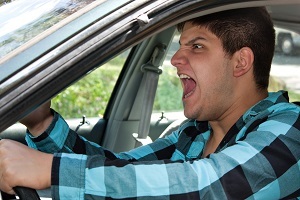 How can I avoid becoming a victim of someone with road rage? There are actually quite a few things you can do – and avoid doing – that will help to reduce the chances of you being involved with a driver prone to road rage. When merging, make sure you have plenty of room. Use your turn signal beforehand to show your intention to merge. Likewise, if another river cuts you off, slow down and give them room to merge. Even if you are “in the right” by driving at the speed limit, if someone wants to pass you, move over and let them. You should allow at least a 2-second space between your vehicle and the one in front of you. Likewise, if you feel that you are being tailgated, signal and pull over to allow the other driver to pass. Make sure to keep your hands on the wheel at all times while driving. If you think you’re being followed by an angry driver, use your cell phone to call police. If you don’t have a cell phone, drive to a place where lots of people are gathered and use your horn to get someone’s attention. Sometimes, the most important actions you can take to avoid road rage takes place inside your head. Changing your approach can make the entire trip a much more enjoyable – and safe – journey.